Climb aboard one of the museum's vintage passenger trains for a 50-minute round trip through the Piatt County countryside. At the museum site, visitors are welcome to tour the vintage pieces of railroad equipment on display. 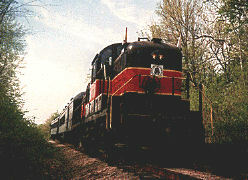 The museum is open and trains operate regularly Saturdays and Sundays, from May through October. Click on the "Website" link to the right to learn about the museum and all the events. Moms ride free with accompanying children! Dads ride free with accompanying children! Experience riding behind the 1907 Southern 2-8-0 steam locomotive #401. Enjoy the annual fireworks show from the railroad and leave the traffic behind! Take a trip on the train, get a lunch and special visit with Santa!